Immaculate Wrangler Sahara Unlimited! New rear brakes and rotors, fresh oil change, Carfax certified. 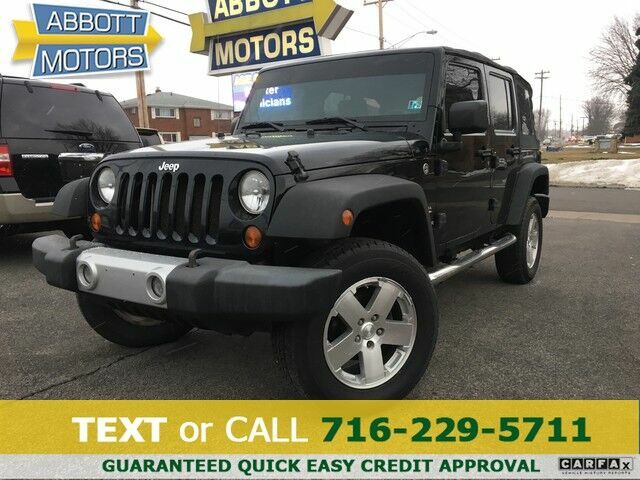 ABBOTT MOTORS, An exceptional car buying Experience, is offering this exceptional Black 2008 Jeep Wrangler 4Dr Unlimited Sahara 4WD for sale. CALL or TEXT (716) 229-5711 for quick answers to your questions about this vehicle. Your message will be answered by a real human never an automation. We stock only the highest quality vehicles which have undergone a full safety inspection, fresh oil change, professional detail and Carfax Guarantee. All vehicles come with a Written Warranty and Extended Warranties are also available. Your buying risks are reduced thanks to a CARFAX BuyBack Guarantee. The Jeep Wrangler 4Dr Unlimited Sahara 4WD offers a fair amount of utility thanks to its advanced features and unique styling. It's also quite sporty, and injects an ample amount of handling chutzpah into the ridin'-high body of a family-friendly SUV. Handle any terrain with ease thanks to this grippy 4WD. Whether you're on a slick pavement or exploring the back country, you'll be able to do it with confidence. It's not a misprint. And the odometer isn't broken. This is a very low mileage Jeep Wrangler. A rare find these days. Pre-owned doesn't have to mean "used." The clean interior of this Jeep Wrangler makes it one of the nicest you'll find. Speed is a game changer and this awesome machine is so fast it didn't just change the game, it rewrote all of the rules. They say beauty is on the inside and once you experience the unbelievable options in this Jeep Wrangler, you'll agree that this is one beautiful vehicle. This Jeep Wrangler comes with new tires for an improved ride, better fuel economy and quieter drive. The paint on this car has no serious defects, blemishes, scratches or scrapes. Unique and nearly impossible to find, this 2008 Jeep Wrangler 4Dr Unlimited Sahara 4WD is a collector's dream come true. This Jeep Wrangler comes equipped with hard-to-find custom wheels. More information about the 2008 Jeep Wrangler: The 2008 Wrangler furthers Jeep's long-established reputation for exceptional off-road ability, and also features a surprising array of modern conveniences, along with very good interior comfort and safety features. The Wrangler may be worth its price for its unique looks and capabilities alone, which explains why it continues to occupy a place at the top of the list of best-selling SUVs on the market. This model sets itself apart with Rugged looks, excellent lifetime limited powertrain warranty., go-anywhere off-road ability, and wide range of configurations ABBOTT MOTORS has over 50 years of automotive experience! We are also a CARFAX Advantage Dealer specializing in outstanding customer service and satisfaction! We offer FINANCING FOR EVERYONE...ALL CREDIT APPS ACCEPTED. We look forward to helping you purchase your next vehicle. Apply Online 24/7 at Abbottmotors.com ... All Trade-ins Welcome... Same Day Delivery... Call or Text Today and See The Difference... We Look Forward to Serving You!! This vehicle may be subject to potential open recall(s). Vehicle recall information may be found at Safecar.gov. Please verify price, equipment, options and features with your sales rep before your purchase. We Look Forward to Serving You. *Tax, title, plates extra. All Financing On Approved Credit. We are a BBB accredited member.